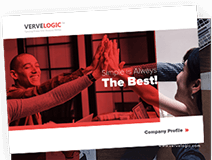 Verve Logic have a scientific approach that helps our clients to learn more traits of the market and drive revenue. Let us share our few tricks accessible on our arsenal. Our eligible professionals deliver boardroom-ready insights, improving your campaign performance and driving significant results. Drive more opportunities into your sales pipe by accentuating your prospecting technique. I was launching a product and needed some help. Happy that i contacted you guys. Great service. Very spontaneous and well thought process taken for my purpose. Well strategized and focused team to work with. Highly satisfied! Skilled professionals with good amount of experience and vision. I have got such an amazing experience that I would love to come back to you guys.